Dietary patterns developed during adolescence and young adulthood may contribute to obesity and eating disorders and may increase risk for several important chronic diseases later in life. Furthermore, the prevalence of overweight has increased significantly, in particular among minority populations and young people from low socio-economic backgrounds. In order to address these growing problems, it is essential to identify which groups of young people need to be targeted for intervention and to identify the factors that need to be addressed in interventions. Large gaps exist in our understanding of the factors associated with nutritional intake, physical activity, and weight status among young people. Projects EAT-I and EAT-II (Time 1 and Time 2 data collection) were supported by the Maternal and Child Health Program (Title V, Social Security Act), Health Resources and Services Administration, Department of Health and Human Services (grants MCJ-270834 and R40 MC 00319). Projects EAT-III and EAT-2010 were funded by the National Heart, Lung, and Blood Institute, National Institutes of Health (grant R01HL084064). Project EAT-IV, a 15-year follow-up study, is ongoing and supported by the National Heart, Lung, and Blood Institute, National Institutes of Health (grant R01HL116892). Project investigators are faculty at the University of Minnesota’s School of Public Health and teach courses in Public Health Nutrition, Epidemiologic Methods, and Biostatistics. Check out recent findings from Project EAT on food security and parenting on the Health Talk blog! Marla Eisenberg, ScD, MPH is an Associate Professor in the Department of Pediatrics, Division of Adolescent Health and Medicine. She was the Project Director on Project EAT-II and has continued her involvement with the study as a co-investigator on Projects EAT-III and EAT-IV, EAT 2010, and Project F-EAT. Dr. Eisenberg has been very involved in survey development, data analysis and manuscript writing. As a social epidemiologist, her interests are in the social forces which influence adolescent health behaviors. On Project EAT, she has examined the relationships between weight-teasing and emotional well-being, peer harassment in schools and school success, and family meal patterns and a variety of high risk behaviors. Jerica Berge, PhD, MPH, LMFT is an Associate Professor in the Department of Family Medicine and Community Health at the University of Minnesota Medical School and a behavioral medicine provide at the University of Minnesota North Memorial Hospital Family Medicine Residency and a clinical family researcher. She received her PhD in marriage and family therapy from the University of Minnesota. Dr. Berge has been involved as a co-investigator on Project F-EAT and Project EAT IV. Dr. Berge’s research interest is in investigating how familial influences can create risk or protective factors for childhood and adolescent obesity. She has written papers on the influence of the significant other on health behaviors and weight status, and the association between parenting style and child health behaviors and weight status from Project EAT data. Dr. Berge also serves as an associate director of the University’s Citizen Professional Center, which conducts and promotes community-based participatory research on problems of concern to communities and professionals. Melissa Nelson Laska, PhD, RD is an Associate Professor in the Division of Epidemiology and Community Health at the University of Minnesota. She has been involved in the study as a co-investigator on Projects EAT III and EAT IV. Dr. Laska’s primary research interests are in environmental and behavioral determinants of excess weight gain during adolescence and young adulthood. Her current work focuses on identifying weight gain prevention strategies for young adults, particularly in targeting influential determinants of nutrition and physical activity within post-secondary campus settings. Dr. Laska received a BS in Nutritional Sciences from Cornell University, and a PhD in Nutrition with a concentration in Epidemiology from the University of North Carolina at Chapel Hill. In addition, she has trained at Vanderbilt University Medical Center and the Children’s Hospital of Philadelphia. Melanie Wall, PhD is a Professor of Biostatistics at Columbia University. She has been a co-investigator and statistician on Project EAT since 1999. Her research interests are in statistical modeling of behavioral health data, in particular using latent variable models like structural equation models. Richard MacLehose, PhD is an Associate Professor in the Division of Epidemiology and Community Health at the University of Minnesota. His interests are in epidemiologic methods, Bayesian analysis and causal inference. Dr. MacLehose has been a co-investigator and statistician on Project EAT since 2009. His contributions to Project EAT involve study design and analysis as well as the development of methods for appropriate statistical inference. Nicole Larson, PhD, MPH, RDN is a nutritional epidemiologist and Senior Research Associate in the Division of Epidemiology and Community Health. She has served as the Project Director for the EAT studies since 2007 and is currently a co-investigator for Project EAT IV. Dr. Larson coordinated data collection and has played a large role in survey development for EAT 2010, EAT-III, and EAT-IV, including pilot testing with diverse young people and the refinement of web-based forms for collecting dietary intake data. Over the past 10 years, her research publications have focused on factors within social and physical environments that may be modified to promote healthy eating among children, adolescents, and young adults. She has made use of data from the EAT studies to examine how dietary intake changes during the transition from adolescence to young adulthood and what individual and socioenvironmental factors influence those changes. She has additionally been involved in several analyses using data from EAT 2010 to cross-sectionally examine the multi-contextual influences on weight status, dietary intake, and physical activity within the home/family, friend, school, and neighborhood environments of adolescents. Anne Gerlach, MPH, RD is a Senior Coordinator in the Division of Epidemiology and Community Health at the University of Minnesota. She currently serves as the Project Manager for Project EAT 2010-2018. She has over 17 years of experience working a research coordinator for NIH-funded studies, primarily focused on obesity prevention. She earned a BS in Dietetics from the University of Rhode Island, and an MPH in Public Health from the University of Minnesota. Ann Forsyth, PhD, MA is a Professor in the Harvard University Graduate School of Design and has served as a co-investigator/consultant on EAT 2010 and the follow-up study underway. Her training is in city planning and architecture and her work focuses on the social aspects of physical planning, urban design, and urban development. Dr. Forsyth has done work on walkability and the relationship between health and the built environment funded by such organizations as the Robert Wood Johnson Foundation and the National Institutes of Health. She is the editor of two handbooks about using geographic information systems (GIS) to measure the intersections between health and the built environment as well as a collaborator on a number of tools featured on the web site www.designforhealth.net. Katie Loth, PhD, MPH, RD is an Assistant Professor in the Department of Family Medicine and Community Health. She earned her Master’s degree in Public Health Nutrition and her PhD in Behavioral Epidemiology from the School of Public Health at the University of Minnesota. As a PhD student, she served as the Project Director for Project F-EAT and examined associations between food-related parenting practices and adolescent weight status and disordered eating behaviors as part of her dissertation research and is now a co-investigator on the project. Working on both Project EAT and F-EAT has allowed Dr. Loth to explore her interests of social and environmental influences on child and adolescent weight status and disordered eating behaviors. Specifically, she is interested in identifying ways that parents can work to help their children develop and maintain a healthy weight and a healthy relationship with their bodies. Dr. Loth is also a dietitian and sees patients in local clinics and helps to train medical residents. Jayne A. Fulkerson, PhD is a Professor in the School of Nursing. She was involved as a co-investigator on Project F-EAT. As a psychologist she conducts family-focused, community-based research. Her research is focused on changing the home food environment and promoting family meals. She blends her content knowledge in eating behaviors, family meals, childhood obesity and nutrition interventions with her skills in methodology, statistical analysis and program evaluation. Peter Hannan, MStat (deceased) was a statistician and analyst for Project EAT from 1997-2015. He made sure that analyses for the project were carried out with statistical appropriateness and developed methods to avoid unnecessarily dropping participants from analytic models. He performed analyses for numerous published papers using EAT data to advance knowledge regarding body image, dieting, disordered eating, and how they may be affected by characteristics such as ethnicity/race, gender, grade level, or socioeconomic status. In the course of this work, Peter mentored numerous students, fellows, and young investigators who are now actively pursuing research in the field of public health nutrition and community health promotion. John Sirard, PhD is an Assistant Professor in the School of Public Health and Health Sciences at the University of Massachusetts Amherst. He is an expert in physical activity assessment and was involved as a co-investigator on Project EAT-III and EAT 2010. His research interests include physical activity measurement in children and adolescents, the effect of the environment on physical activity and sedentary behavior, and the promotion of physical activity for the prevention of overweight and obesity in youth. More than 4700 adolescents from 31 metropolitan middle and high schools in Minnesota completed surveys about their eating habits as part of Project EAT I. Baseline surveys and anthropometric measurements were completed in school classrooms during the 1998-1999 school year. In addition, a similar telephone questionnaire was administered to 902 parents of adolescent participants. Details of the research design are described below and published manuscripts from Project EAT I are posted on the Publications page. Are adolescents eating in accordance with the Healthy People recommendations? Which subgroups of adolescents are at greatest risk for not meeting these objectives and need to be targeted for interventions? What are the direct and indirect overall contributions of socio-environmental, personal, and behavioral factors to the explained variance in dietary intake and Body Mass Index? What specific measures from within the socio-environmental, personal, and behavioral factors are associated with dietary intake and Body Mass Index among adolescents? Qualitative data collected from focus groups were analyzed by the constant comparative method. Quantitative data collected from survey participants were analyzed by a variety of statistical methods according to whether the data were categorical or continuous and according to the purpose of the analysis. For details please see the individual publications from Project EAT. Focus groups were conducted with 141 adolescents to insure all relevant factors effecting their eating and physical activity behaviors would be included in the model and survey. Surveys were administered by trained research staff to middle and high school students in the Minneapolis, St. Paul, and Osseo school districts in Minnesota. Students completed a food frequency questionnaire and the Project EAT Student Survey (n=4,746). The Project EAT Student Survey, developed by the principal investigator, Dr. Neumark-Sztainer, and research team includes questions on self-reported height and weight, potential correlates of dietary intake, and weight control behaviors. For more details about the survey please see the Surveys section below. After completion of the surveys, height and weight measurements were collected from students privately using a standardized protocol. A similar telephone questionnaire focusing on socio-environmental factors was administered to randomly selected parents (n=902) of students who completed the survey. Random selection was done after stratifying students by ethnicity in order to assure adequate representation from each group. Trained staff at the Data Collection and Support Services or Wilder Research Center administered all questionnaires. Who participated in Project EAT? The longitudinal design of EAT II followed the same students surveyed in Project EAT I during their transition to late adolescence and young adulthood. More than 2,500 participants completed follow-up surveys assessing personal, behavioral, and socio-environmental constructs in the model of factors hypothesized to influence eating behaviors. Data collection was completed in June 2004. Published manuscripts from Project EAT II. Have there been changes in secular trends over the past 4-5 years? What important changes occur as youth progress through different stages of adolescence? What are the most relevant socio-environmental, personal, and behavioral predictive factors during these different stages? How do prevalence and predictors differ for youth by gender, race/ethnicity, and socioeconomic status? In all analyses data are weighted to adjust for differential response rates using the response propensity method for a large number of predictor variables available from the EAT I survey (i.e., gender, native born, ethnicity/race, socioeconomic status, overweight status, parental marital status, individual’s concern about health, and most common grade in school). Survey data collected are analyzed by a variety of statistical methods according to whether the data represents categorical or continuous variables and according to the purpose of the analysis. For details please see the individual publications from Project EAT II that will be posted online as manuscripts are published. To address the Project EAT II objectives and examine changes in eating patterns and weight status over 5 years, surveys were mailed to all original Project EAT I participants for whom contact information was available in 2003-2004. 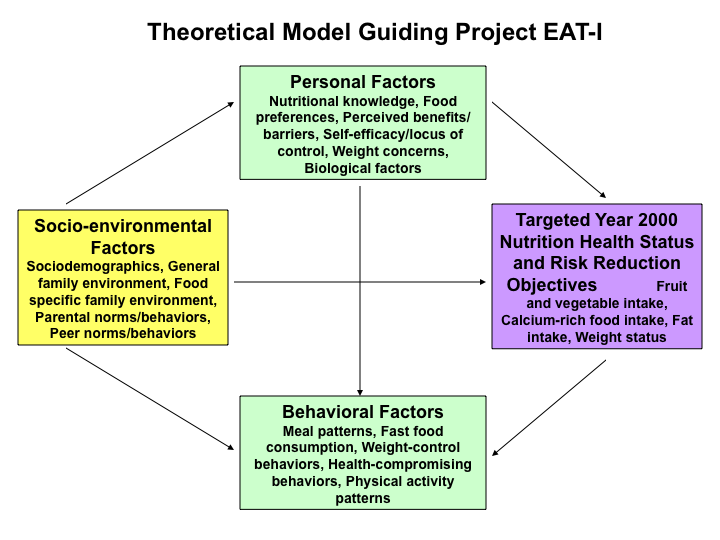 The Project EAT I survey was revised and two versions based on the model were developed. One version was mailed to participants who were in junior high school at time 1 (time 2 high school cohort) and a second version to participants who were in senior high school at time 1 (time 2 post-high school cohort). Some items from the original survey were dropped due to data redundancy (e.g., childhood weight) and several new items were added following focus groups with young adults that raised topics of relevance to the post-high school cohort. For more details about the surveys please see the Surveys section below. Between April 2003 and June 2004, Project EAT II surveys and food frequency questionnaires were mailed to both cohorts randomly selected into 6 waves by the Data Collection and Support Services in the Division of Epidemiology and Community Health, University of Minnesota. An effort was made to include as many of the original participants as possible. If the first survey was not returned, participants were sent 2 reminder postcards and 3 additional survey packets. When mail was returned due to an incorrect address, staff used internet tracking services to identify a current address based on the participant’s parent’s name and last known address. Of approximately 3,700 EAT I participants contacted by mail, 2,516 responded to the EAT II survey. Who participated in Project EAT – II? Project EAT III was designed to follow up with the same young people who were surveyed at Project EAT I as they progressed from adolescence to young adulthood and through their twenties. Nearly 2300 participants completed 10-year follow-up surveys assessing weight status, weight-related behaviors, and potential correlates of these outcomes. Data collection using online and mailed surveys was completed in October 2009. Details of the research design are described below and published manuscripts from Project EAT III will be posted on the Publications page as the survey data are analyzed. Project EAT III aims to determine the prevalence of weight status and related behaviors, including weight control behaviors, dietary intake, and physical activity during young adulthood and trajectories of these variables during the critical transition from adolescence to young adulthood. Project EAT III further aims to enhance our understanding of the environmental, personal, and behavioral factors that influence weight status and related behaviors, including weight control behaviors, dietary intake, and physical activity, during adolescence and young adulthood. The Project EAT survey was revised based on an expanded model, integrating an ecological perspective with Social Cognitive Theory. Survey development involved a comprehensive literature review, focus group discussions, and an assessment of test-retest reliability. Additional details about the Project EAT III survey are posted online. Survey invitation letters, providing the web address and a unique password for completing the online version of the Project EAT III survey and a food frequency questionnaire were mailed to all original Project EAT I participants for whom contact information was available. Participants who did not respond to the initial invitation were sent three reminder letters. The second reminder letter included paper copies of the survey and food frequency questionnaire, and all other mailings included a postage-paid card for requesting paper copies. Data collection ran from November 2008 to October 2009 and was conducted by the Health Survey Research Center in the School of Public Health at the University of Minnesota, Minneapolis. Who Participated in EAT III? Of approximately 3442 EAT I participants contacted by mail, a diverse group of 1030 men and 1257 women responded to the EAT III follow-up survey. One third of participants (31%) were aged 20 to 25 years and two thirds (69%) were aged 26-31 years. Project EAT IV is designed to extend the follow up of young people who were surveyed at Project EAT I to a 15-year period, from adolescence (ages 12-18) to young adulthood (ages 27-33). In addition, for the first time, surveys will be collected from participants’ significant others when applicable and pre-adolescent (ages 9-11) and adolescent (ages 12-18) children of participants will be recruited into the study. As a pilot study, up to one pre-adolescent or adolescent child per participant will be asked to participate in height and weight measurements and respond to survey questions about their own eating behaviors, physical activity, and weight-related problems. Collecting inter-generational data in future study waves when a larger proportion of participants are expected to have children ages 9-18 years will allow for answering how weight-related behaviors are passed on from one generation to the next and the types of factors that influence the transmission of these behaviors. Data collection using online surveys and phone interviews is ongoing. Details of the research design are described below and published manuscripts from Project EAT IV will be posted on the Publications page as the survey data are analyzed. The overall aim of Project EAT IV is to build a greater understanding of how eating behaviors, physical activity patterns, and weight-related problems, along with the various factors that influence these outcomes, track over the life course from adolescence to young adulthood. Project EAT IV is also designed to learn how eating behaviors, physical activity patterns, and weight-related problems during adolescence, and relevant influences on these outcomes in adolescence, predict young adults’ parenting practices regarding eating, activity, and weight. Among participants who are parents, the study will attempt to identify implications for their children and what factors in young adulthood modify the strength of these relationships. The theoretical model guiding the design of Project EAT IV is informed by social cognitive theory and an ecological perspective. Additionally, Project EAT IV is being guided by a life course approach to enhance our understanding of trajectories of eating behaviors, physical activity, and weight-related problems, and influences on these outcomes, throughout the lifespan and across generations. Survey development was directed by theory, an updated literature review, a review of surveys and findings from previous study waves, several reviews of draft surveys by content experts, focus groups with young adults in their late twenties and early thirties, and psychometric testing. The surveys developed for assessing constructs in young adult participants (EAT IV), significant others (Partners EAT), children (EAT Gen2), and co-parents (Parent EAT) will be made available to other researchers online following the completion of fielding. Survey invitation letters, providing the web address and a unique password for completing the online version of the Project EAT IV survey and a food frequency questionnaire were mailed to all original Project EAT I participants for whom contact information was available in January 2015. Participants who do not go online to complete the survey in response to the initial invitation will be sent a reminder letter and also given the opportunity to complete the survey by phone. Similarly, survey data are being collected from significant others, children, and co-parents using online surveys and phone interviews when consent is provided by the young adult participant enrolled in the longitudinal study. Data collection is being conducted by Wilder Research, the research arm of the Amherst H. Wilder Foundation, in St. Paul, Minnesota. Project EAT 2010 used an ecological framework to guide the collection of data at the individual, family, friend, school, and neighborhood levels on factors of potential relevance to weight status and related behaviors among adolescents. Approximately 2800 adolescents from 20 metropolitan middle and high schools in Minnesota completed surveys about their eating, physical activity, and weight-related behaviors. Surveys and measurements of student height and weight were completed in school classrooms during the 2009-2010 school year. In addition, measurements of peer, school, and neighborhood environments were completed by peers themselves, school personnel, and Project EAT staff. Parents of the adolescent participants were invited to complete surveys regarding home environments as part of Project F-EAT. Details of the research design are described below and published manuscripts from Project EAT 2010 will be posted on the Publications page as the data are analyzed. How do weight status and related behaviors among adolescents compare with the Healthy People Objectives? 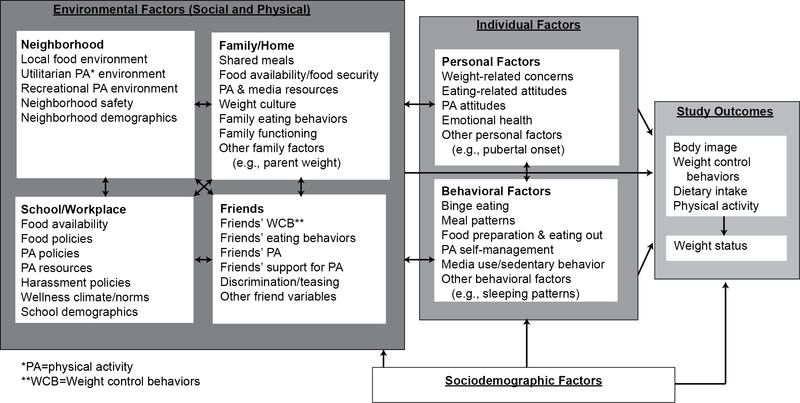 How do different factors, including characteristics of environments (i.e., home/family, peer, school, and neighborhood environments), personal factors and behavioral factors, work together to influence weight status and related behaviors? What are the most important environmental, personal, and behavioral influences on weight status and related behaviors for adolescents? How do weight status, weight-related behaviors, and influencing factors differ across gender, ethnicity/race, and socioeconomic status? What secular changes in weight status and related behaviors have occurred over the past 10 years among middle school and high school students? Surveys were administered by trained research staff to middle and high school students in the Minneapolis and St. Paul school districts in Minnesota. Students completed the Project EAT 2010 Student Survey, a food frequency questionnaire, and a physical activity questionnaire. The Project EAT 2010 Student Survey was developed by the principal investigator and research team to assess weight status, weight-related behaviors, and potential correlates of these outcomes. Trained research staff also collected student height and weight measurements using a standardized protocol. Surveys regarding the school environment were completed by personnel at each participating school, including an administrator, food service manager, and physical activity teacher. The surveys were designed to assess school resources, policies, and practices of relevance to eating, physical activity, and weight-related harassment. Geographic data are being used to learn about residential and school neighborhood environments. Measurements relating to local food environments, utilitarian physical activity environments, recreational physical activity environments, and neighborhood safety are being completed by the Spatial Analysis Core at the Minnesota Population Center. Additional details about the EAT 2010 Survey are posted online. 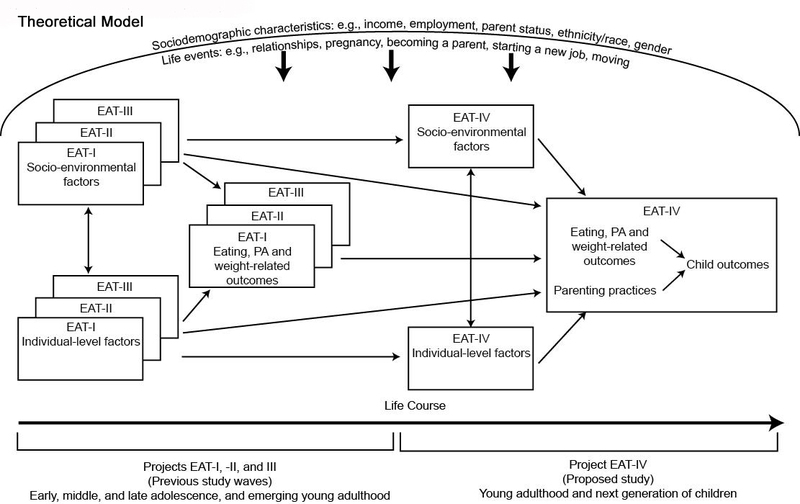 Project F-EAT is an ancillary study to EAT 2010 (Eating and Activity in Teens) designed to examine influences within the family and home environment on eating, physical activity, and weight-related behaviors of adolescents. Project F-EAT surveys were completed by a sample of approximately 3,700 parents or guardians of the adolescents enrolled in EAT 2010. Adolescents participants in the EAT 2010 study were asked to identify up to two parents or guardians. Parents were invited to complete the survey via mail or over the telephone and a response rate of 79% was achieved. To meet the needs of this culturally diverse group of parents, both the mailed and telephone survey were available in English, Spanish, Hmong, and Somali and the telephone survey was additionally offered in Oromo, Amharic and Karen. Project F-EAT (Families and Eating and Activity in Teens) will improve our understanding of how the family and home environment influence the eating, physical activity, and weight-related behaviors of young people. How do parents of adolescents describe their family and home with regard to weight culture (for example; parental weight control, parental body image, weight teasing, etc.) and the food and physical activity environments, and what are the associations with adolescents’ weight status, body image, weight control practices, dietary intake, and physical activity? How do parental reports of the familial and home environment, and associations with adolescent eating, physical activity, and weight-related outcomes differ across ethnicity/race, socioeconomic status, age of adolescent, gender of adolescent and parent, and weight status of adolescent and parent? How does the familial and home environment interact with adolescents’ individual characteristics (for example, body image, weight control behaviors, etc. ), and peer, school, and neighborhood environments, to predict adolescent eating, physical activity, and weight-related outcomes? What have been the 10-year secular trends from 1999-2009 in parental reports of weight culture and food and physical activity environments within adolescents’ homes? To address the Project F-EAT objectives, the parents (or other caregivers) of adolescents participating in Project EAT III are being asked to complete a survey by mail or phone. The Project F-EAT survey was developed by a multi-disciplinary research team. An ecological framework developed by the research team was used to guide survey development. Each section of the survey was reviewed by a member of a review panel with an expertise in that content area. Finally, the survey was pilot tested with focus groups parents of adolescents. Invitations to complete the Project F-EAT survey are being mailed to the home address of parents, including up to two parents for each teenager participating in Project EAT III. If a mailed survey is not returned, parents are also invited to complete the Project F-EAT survey over the telephone. Mailed surveys and telephone interviews were translated into English, Spanish, Hmong, and Somali. Parents are being mailed surveys in the language their teenager indicates is primarily spoken at home. Additional details about the Project F-EAT Survey are posted online. Findings from Project EAT have been disseminated in more than 150 publications and numerous presentations. For more information, please see our Publications page. Over the past decade (1999-2010) between Project EAT I and EAT 2010, ethnic/racial disparities in the prevalence of obesity increased, pointing to a need for more effective interventions aimed at reaching diverse populations. A high number of adolescent boys (38%) and girls (50%) participating in EAT 2010 used unhealthy weight control behaviors such as skipping meals, taking diet pills, and smoking more cigarettes to lose or control their weight. Being teased about one’s weight in middle school or high school predicts poorer emotional well-being and use of unhealthy weight control behaviors in late adolescence and early young adulthood. Higher levels of body dissatisfaction during adolescence are related to greater use of unhealthy behaviors that may lead to weight gain. Only 30% of adolescent girls and 43% of adolescent boys were found to be getting enough calcium. Many adolescents skip breakfast and just 37% of participants in EAT 2010 reported eating breakfast daily. Participation in family meals varies widely among youth and is related to a number of positive outcomes, including better dietary intake, fewer unhealthy weight control behaviors, and better psychosocial health. A high number of parents/caregivers of adolescents (39%) experienced food insecurity in 2010 and were at increased risk for poor nutrition outcomes. Vegetarianism was reported by 6% of adolescents. Just over 50% of adolescent participants in EAT 2010 achieved current recommendations for physical activity by participating in at least seven hours per week. The increasing prevalence of overweight and obesity among adolescents is a major public health problem. Over the past decade (1999-2010) between Project EAT-I and EAT 2012, the overall prevalence of obesity and ethnic/racial disparities increased, particularly among boys. Results from the most recent EAT 2010 survey indicated that approximately 19% of girls and 26% of boys had body mass index values at or above the 95th percentile, which is the cut-off point used for defining obesity in youth. Another 20% of girls and 16% of boys were overweight (defined as at or above the 85th percentile but less than the 95th percentile). Girls: For girls, obesity was most common among African American, Hispanic and Native American youth. The prevalence of obesity was considerably lower among Asian American and White girls, but there was evidence of an increase in the prevalence of obesity over the past decade among Asian youth from 7% to 13%. Boys: Obesity was more common among Hispanic, Asian, and Native American boys than White and African American boys. Evidence of increases in the prevalence of obesity over the past decade was observed for African American (from 14% to 21%) as well as Asian (from 21% to 33%) and Hispanic youth (from 20% to 34%). Longitudinal results from Projects EAT I, II, and III have also shown overweight/obesity increases among young people during the transition from adolescence to young adulthood. Among youth who were not overweight in adolescence, 34% of females and 45% of males were found to have a body mass index in the range used to define overweight or obesity when they reached young adulthood. The use of dieting and unhealthy weight control behaviors is common among teenagers and may counter-intuitively lead to weight gain through the long-term adoption of unhealthy behaviors such as binge eating, reduced breakfast consumption, and lower levels of physical activity. Over the past decade (1999-2010) between Project EAT I and EAT 2010, there were decreases in the percent of young people using unhealthy weight control behaviors while healthy behaviors were found to increase. Nearly one third of boys and 46% of girls went on a diet in the past year. Fifty-four percent of boys and 58% of girls regularly used healthy weight control behaviors such as eating less high-fat food, eating less sweets, and eating more fruits and vegetables over the past year. A concerning 38% of boys and 50% of the girls used unhealthy weight control behaviors such as skipping meals, taking diet pills, and smoking more cigarettes specifically to lose or control their weight. A smaller but quite worrisome percentage of students were the 4% of boys and 7% of girls who reported use of extreme weight control behaviors such as taking laxatives or diuretics, vomiting after meals, or fasting. The prevalence of dieting increased from 22% to 28% among male participants who transitioned from middle adolescence (mean age = 16 years) to middle young adulthood (mean age = 26 years). The use of unhealthy weight control behaviors remained high but showed a small decrease in prevalence (from 61% to 54%) among female participants who transitioned from middle adolescence to middle young adulthood. Among female participants who transitioned from early adolescence (mean age = 13 years) to early young adulthood (mean age = 23 years), the prevalence of extreme weight control behaviors more than doubled from 8% to 20%. Approximately 22% of adolescent boys and 25% of adolescent girls who participated in Project EAT-I reported being teased about their weight at least a few times per year. These young people reported teasing by both peers and family members. These findings are concerning as being teased about one’s weight in middle school or high school was found to predict poorer emotional well-being five years later in Project EAT II. Adolescents who were ever teased about their weight reported lower levels of self-esteem and higher levels of body dissatisfaction. Among females and older males (in high school at EAT I), ever being teased about one’s weight also predicted more depressive symptoms five years later. Females who reported being teased about their weight at Project EAT I were also more likely to report frequent dieting at five-year follow-up than their peers who were not teased. Males who reported being teased about their weight at Project EAT I were more likely than their peers to report binge eating and the use of unhealthy weight control behaviors five years later. Findings from Project EAT III further indicate that weight teasing remains a concern as young people transition from adolescence to young adulthood. The prevalence of weight teasing remained stable among most groups and, among males transitioning from early adolescence (mean age = 13 years) to early young adulthood (mean age = 23 years), reports of experiencing weight teasing at least a few times each year were found to increase from 18% to 27%. High prevalences of adolescents express body dissatisfaction, which was found to longitudinally predict both unhealthy behaviors and weight gain. Project EAT I found that 46% of girls and 26% of boys had high levels of body dissatisfaction. Body dissatisfaction during the teen years is related to greater use of unhealthy behaviors that may lead to weight gain. Young people having higher levels of body dissatisfaction at Project EAT I were more likely to report unhealthy weight control behaviors, binge eating, and lower levels of physical activity at five-year follow-up. Higher levels of body dissatisfaction at EAT I predicted greater weight gains over time, even after taking starting body mass index into account. Higher levels of body dissatisfaction at Project EAT I were further related to increased risk for depression and poor self-esteem over time. Project EAT I found there are large gaps between nutrition recommendations and the actual dietary patterns of adolescents. Among the students surveyed, only 30% of girls and 42% of boys consumed the recommended amount of calcium (1300 mg or more per day). Approximately 45% of both girls and boys ate more than two servings of fruit per day, while only about 16% ate more than three servings of vegetables per day. Middle school students had higher calcium, fruit, and vegetable intakes than older students in high school. Across ethnicity, nutrient intakes varied considerably. Fewer Asian American and Hispanic youth met calcium intake recommendations compared to their peers. However, Asian American and Hispanic youth were most likely to report eating five or more fruits and vegetables daily. Over the five years between Project EAT I and Project EAT II, young people decreased their intake of fruits and vegetables as they transitioned from middle school to high school and from high school to post-high school. Eating breakfast has been linked to better academic performance and overall dietary intake, and may also contribute to maintenance of a healthy weight. Results from the most recent EAT 2010 survey indicated that just 37% of adolescent participants ate breakfast every day. Another 30% of adolescents ate breakfast 3-6 days a week. Of concern, 22% only ate breakfast 1-2 days a week and 11% of adolescents never ate breakfast. Family meals are a challenge given the busy schedules of adolescents and their parents, but eating together is beneficial when it does occur. Major reasons for not having family meals include parent and adolescent schedules, adolescents’ desire for autonomy, dissatisfaction with family relationships, and dislike of foods served at family meals. Project EAT I found that adolescents eating regular family meals had higher fruit, vegetable, and calcium intakes than their peers not reporting regular family meals, and they drank significantly fewer soft drinks. Results from Project EAT II further showed that young people who were having more family meals during high school had higher daily intakes of fruit, vegetables, calcium, and other important nutrients in early young adulthood. Project EAT III survey results showed that having more frequent shared household meals in young adulthood was associated with some markers of better nutrition. A higher frequency of shared household meals in young adulthood was predicted by having more frequent family meals during adolescence. In addition to the observed nutritional benefits, family meals have also been cross-sectionally and/or prospectively related to higher academic performance, greater psychosocial well-being and a reduced risk of using unhealthy weight control behaviors. Over the past decade (1999-2010) between Project EAT I and EAT 2010, increased attention has been given to family meals in the scientific literature and popular media. Despite this attention to the benefits of eating together, results from the recent EAT 2010 survey indicated the frequency of family meals either remained constant or decreased in the homes of adolescents across different segments of the population. Food-insecure parents ate breakfast less frequently, consumed more sugar-sweetened beverages, and were more likely to report binge eating compared to those who were food secure. Among parents who reported having family dinners, those who were food insecure reported more often serving sugar-sweetened beverages at dinner and less often serving healthy items such as green salad, vegetables, and fruit compared to those who were food secure. In comparison to food-secure parents, those who were food insecure reported greater barriers to purchasing fruits and vegetables in terms of neighborhood access to a variety of affordably-priced and high-quality produce. Vegetarianism was reported by about 6% of adolescents who participated in Project EAT-I, nearly 75% were females, and 75% had been so for longer than 1 year. Vegetarians were more likely to use unhealthy weight control behaviors, particularly males. Since vegetarianism seems to have interest and appeal to adolescents, education regarding healthy vegetarianism is critical to help prevent unhealthy weight control behaviors among youth. Physical activity has numerous benefits, including better cardiovascular health, stronger bones, and improved mental health and mood. The Physical Activity Guidelines for Americans recommend that adolescents do 60 minutes or more of physical activities every day. It is also recommended that young people limit their time spent in more sedentary activities. Specifically, the American Academy of Pediatrics recommends that adolescents spend no more than two hours on an average day with screen media, including TV and video watching as well as time spent playing video games and using a computer for activities other than homework. Results from the recent EAT 2010 survey indicated that just over 50% of adolescent participants met the current guidelines for physical activity by participating in at least seven hours of physical activity per week. Approximately 85% of young people exceeded the American Academy of Pediatrics recommendation for screen time and reported more than 14 hours of screen time in a given week; 47% reported more than 35 hours of screen time. Longitudinal results from Projects EAT I, II, and III have also shown that moderate and vigorous physical activity tends to decrease and computer use (not for work or homework) tends to increase as young people transition from adolescence to young adulthood. The baseline Project EAT survey was completed by participants attending middle school and high school in 1998-1999. This 5-year follow-up survey was completed by participants who were middle adolescents in 2003-2004. This 5-year follow-up survey was completed by participants who were 18-23 years in 2003-2004. This 10-year follow-up survey was completed by young adult participants who were ages 20-31 years in 2008-2009. This survey was completed by the parents/caregivers of young people attending middle school or high school during the 2009-2010 school year. This survey about eating, physical activity, and weight-related behaviors was completed by young people attending middle school or high school during the 2009-2010 school year. For constructs assessed on the EAT 2010 and Project F-EAT surveys, this table provides selected psychometrics and references for the original source of measures. For constructs assessed on the Project EAT III Survey, this table provides selected psychometrics and references for the original source of measures. Additional information regarding survey development may be found in the manuscript: Larson N, Neumark-Sztainer D, Story M, van den Berg P, Hannan PJ. Identifying correlates of young adults’ weight behavior: survey development. Am J Health Behav. 2011;35:712-715. The psychometric properties of measures found on Project EAT I and Project EAT II Surveys can be found in published manuscripts. There is no table of psychometrics available for these surveys at this time.